A Slane is an Irish, spade-like tool used for cutting turf and boggy material, and was widely used to transform marshlands in Europe and North America into highly productive agricultural lands in the 1800s. Within the Lake Simcoe basin, the conversion of marsh lands into agricultural lands have provided some of the most productive lands in Ontario, however the development of intensive agriculture has also contributed to wide spread water quality issues throughout the basin. The development of the Spectral LAndscape Nutrient Estimate (SLANE) Model is designed to remotely understand sources of nutrient in surface soils at landscape scales. Remote sensing provides a unique method of examining large geographic areas, such as Lake Simcoe, with minimal resources. Through a pilot project being conducted by RiverLabs, non-point sources of phosphorus across the landscape are being assessed and mapped within the Pefferlaw/Uxbridge Brook and Beaver River sub-watersheds. Non-point sources of nutrients are often very difficult to identify and quantify, however they can have great impacts on receiving waters, especially in areas with high agriculture or human activity. The goal of this pilot project was to understand whether multispectral satellite imagery, including data from the visible, infrared and ultraviolet parts of the light spectrum, is able to estimate soil phosphorus concentrations. Soil phosphorus if mobilized can provide significant non-point source phosphorus contributions to the Lake Simcoe Basin. Soil samples were collected from throughout the Pefferlaw/Uxbridge Brook and Beaver River sub-watersheds. Multispectral satellite imagery and other remote sensing data, in combination with soil samples were used to build a soil phosphorus concentration model. 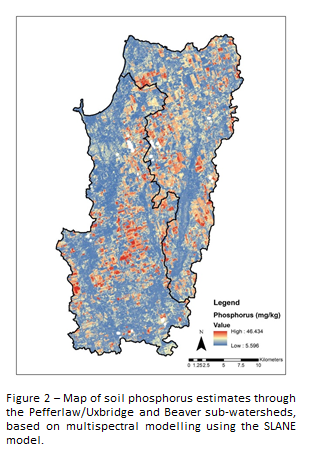 This model was found to accurately estimate soil phosphorus concentrations across the Pefferlaw/Uxbridge Brook and Beaver River Sub Watersheds (Figure 1). 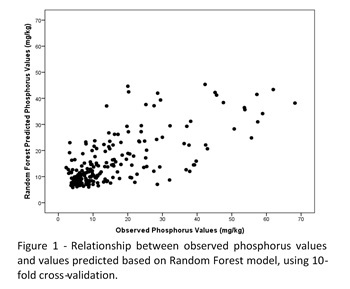 Building on the development of the SLANE model (Figure 2), attempts were made to link estimates of soil phosphorus concentration with observations of total phosphorus within tributaries of Pefferlaw creek and the Beaver River. Significant correlation between average upstream soil phosphorus estimates and observed water total phosphorus was found. With further refinement it is anticipated that this soil phosphorus model may serve as a strong predictor of phosphorus loading within the Lake Simcoe watershed. It is believed that through the use of multispectral satellite imagery, examined in this pilot study represents an important step forward in the monitoring of nutrients within a watershed. It is important to continue to engage with stakeholders to ensure that this tool can be refined for use in watershed management.